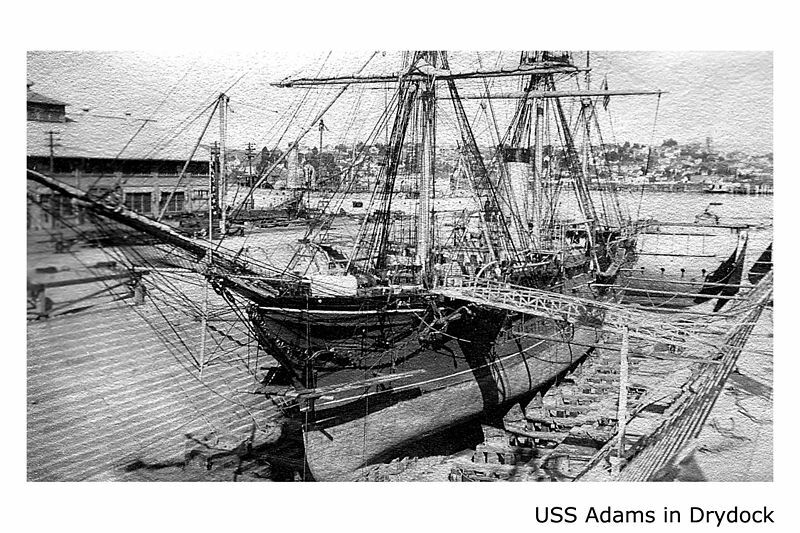 Type and Characteristics - Single screw, wooden-hulled, bark-rigged sloop, Adams or Enterprise-class, built by Donald MacKay, Boston, MA, laid down February 1874, launched 24 October 1874, commissioned at Boston Navy Yard 21 July 1876, 1,375 tons, 185ft long x 35ft beam x 14ft 3in draft, armed with 1-60pdr Parrott rifled and 1-11in/4-9in smoothbore guns, 10kts, 190 crew, first commanded by Cdr John W. Philip. Log Period and Areas of Service - 1876-1919, North Atlantic and South Atlantic Stations, Pacific coast of South & Central America, Alaskan waters, South and Central Pacific, Circumnavigation. 21 July 1876 – Tour of duty on the North Atlantic Station. 2 June 1877 – Tour of duty on the South Atlantic Station. 1 January 1878 – Tour of duty on the Pacific Station. 19 July 1879 – Repairs at the Mare Island Navy Yard. 3 February 1880 – Tour of duty on the Pacific Station. 12 July1881 – Repairs at the Mare Island Navy Yard. 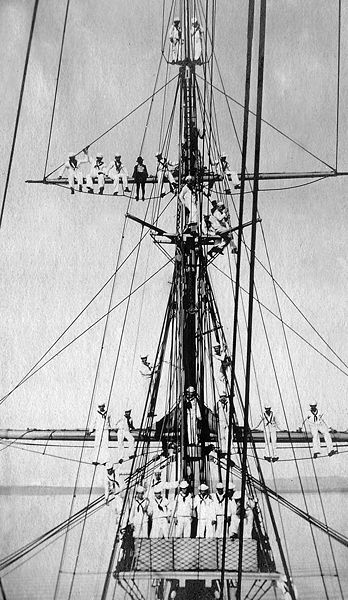 23 August 1881 – Tour of duty on the Central American coast. 11 May 1882 – Repairs at the Mare Island Navy Yard. 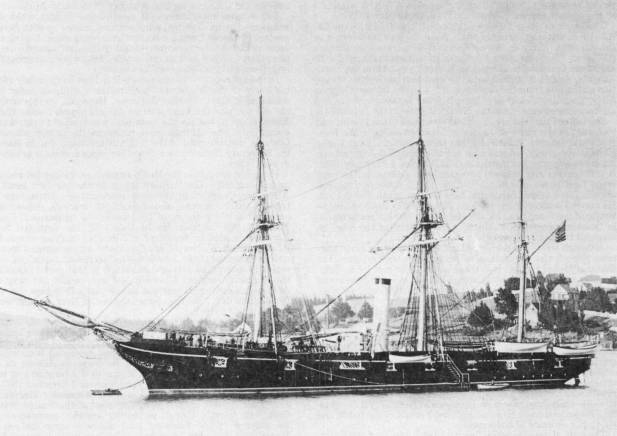 11 September 1882 – Tour of duty in the northern Pacific, Alaskan waters; intervenes in incidents involving representatives of the Northwest Trading Company and the native population. 19 August 1884 – Repairs at the Mare Island Navy Yard; remained inactive for a little more than a year; on 2 November 1885, she was recommissioned at Mare Island, Comdr. Louis Kempff in command. 2 November 1885 – Extended tour of duty on the coasts of Central and South America and the Hawaiian Islands; present in Honolulu for the "Bloodless Revolution of 1887" and the elections held on 12 September 1887. 19 October 1887 – Extended tour of duty in the South Pacific, primarily the Samoan Islands and Hawaii. 1 February 1889 – Repairs at the Mare Island Navy Yard; recommissioned on 22 April 1889, Comdr. Edwin T. Woodward in command. 22 April 1889 – Tour of duty in the South Pacific, primarily the Samoan Islands and Hawaii. 31 July 1890 – Repairs at the Mare Island Navy Yard; remained inactive for almost 20 months; recommissioned on 23 March 1892, Comdr. Thomas Nelson in command. 23 March 1892 – Tour of duty on the Pacific Station, Alaskan waters. 1 December 1892 – Repairs at the Mare Island Navy Yard. 12 April 1893 – Tour of duty in the Hawaiian Islands. 10 May 1894 – Tour of duty on the Pacific Station, Alaskan waters. 12 September 1894 – Repairs at the Mare Island Navy Yard; remained inactive for more than 13 months; placed back in commission on Christmas Eve 1895, Comdr. Eugene W. Watson in command. 24 December 1895 – Tour of duty in the Hawaiian Islands. 12 December 1896 – On duty training recruit apprentices and cruised the waters along the California coast, Hawaii and ports on the west coasts of Canada and the United States. 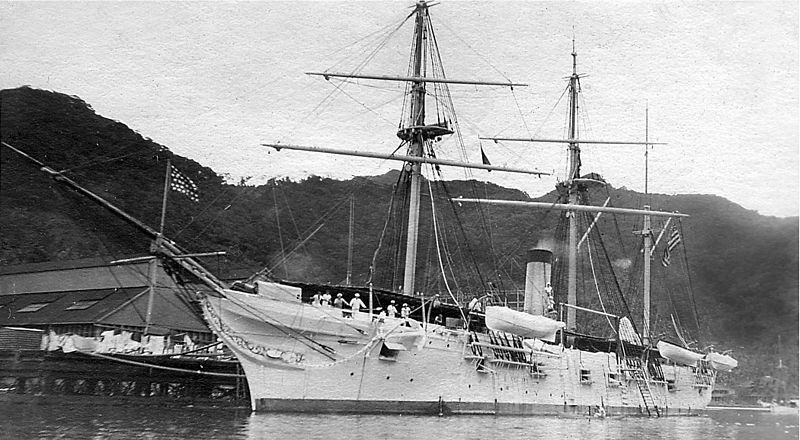 30 April 1898 – Decommissioned; recommissioned, Comdr. George M. Book in command. 7 October 1898 – On duty training recruit apprentices and cruised the waters along the California coast, Hawaii and ports on the west coasts of Canada and the United States. 24 April 1904 – Tour of duty in the South Pacific, primarily the Samoan Islands and Hawaii. 17 June 1907 – Returned to the United States by way of the Indian Ocean, the Suez Canal, the Mediterranean Sea, and the Atlantic Ocean, circumnavigating the globe. 31 December 1907 – Turned over to Pennsylvania and then New Jersey to serve as a school ship for those states’ naval militia. 27 August 1917 – Recommissioned by the Navy to serve as station ship in the Delaware River during the war. Fate - Decommissioned August 1919, sold 1920, briefly in mercantile service, broken up 1921 or 1922.